What a year! In May, Minerd.com celebrated its 15th anniversary – launched a new blog – in March and May enjoyed all-time record numbers of visits – and in November reached its 3 millionth visit of all time. The number of visits in 2015 were the highest since 2007 and totaled 288,095. Over the span of 15½ years since the site was first launched, total visits stood at 3,039,129, up 9.8 percent from 2,751,034 last year at this time. During the year, 1,015 new photo images were added to the site, in comparison with 948 last year. At year-end, the site had a grand total of 13,507 archival images, up from 12,492 last year, a growth rate of 8.1 percent. 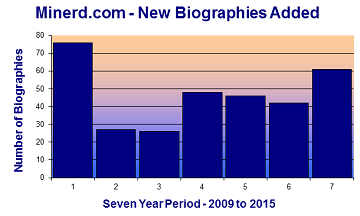 Some 61 new biographies were added in 2015, up 45 percent from 42 last year, for a grand total of 1,593 bios. These bios tell tens upon tens of thousands of family stories unique to the clan. After a big dip during the great recession of 2008-2009, the number of annual visits to Minerd.com has been back on a steady upswing. The number of new bios added in 2015 jumped over 2014. 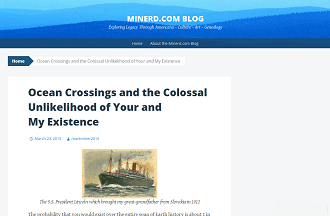 To celebrate the 15th anniversary, I launched the Minerd.com Blog to tell more of the stories of the old forgotten lives and try to make sense of all of the lessons these lives tell us. During the year, 40 posts were made which drew 2,300 views. The busiest day of the year was 61 views the day after Christmas. High Tech, High Touch: Our Fascination with What’s Real? In July, I finally made a research trip to Central Oklahoma which I had been hoping to do for two decades and which I had promised our Okie Felder cousins in 2008 when they came for our Pittsburgh 250 Reunion. I enjoyed dinner at Eischen's in Okarche, the oldest bar in the state of Oklahoma; was introduced to the group at the Armstrong/Barnum Reunion in Guthrie; finally had the privilege of meeting cousin Norman "Keith" Barnum who's coached me on this family since 2001; and toured the old homestead farm in Kingfisher claimed for James and Lydia (Miner) Brown during the Run of 1889. Special thanks are due to Joan (Felder) Geers, Jane (Felder) Nusz and Judge Robert Davis for their over-the-top hospitality. Other research stops during the Oklahoma visit were in Shawnee, Pottawatomie County (Pring and McCollough branches); Crescent, Logan County (Keck); Oklahoma City (Holt); and the Washita National Battle Park in Cheyenne, where General Custer's brother Thomas W. Custer -- who produced a son with one of our cousins -- was wounded in an 1868 attack on a Cheyenne village of Chief Black Kettle. New discoveries came to light during the year about early settlements of the Cain and Earlywine families in the Ohio River communities of Moundsville and New Martinsville in West Virginia’s northern panhandle. They made their homes along Wheeling Creek and Grave Creek in the hills inland of the river. The Earlywines were friends of the famed Wetzel family which produced notorious Indian fighter Lewis Wetzel -- said to have killed 70 native Americans -- and his brother Martin. Author Allan Eckert wrote about this ugly, murderous era in our nation's past in his 1995 historical novel That Dark and Bloody River. 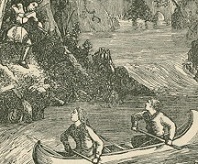 One of the characters in the book, Abraham Earlywine, was believed to have been the grandfather of our Jacob Earlywine. In May 1786, Abraham's son Frederick was lured into a trap on his father's farm by angry Native American warriors, refused to be taken away as a prisoner, and was killed. The 2015 research included visits to the West Virginia University Library and to remote cemeteries in Adaline (Cain family), Middlebourne (Richmond), Silver Hill (Cain) and Smithfield (Jackson) as well as in larger Mountain State communities such as New Martinsville and Moundsville. The Mt. Nebo and Smithfield grave yards were especially remote and difficult to reach. 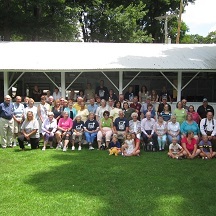 Twenty-nine hardy souls braved an incessant weekend rain storm to attend the 2015 national Minerd-Minard-Miner-Minor Reunion, the clan's smallest gathering since the 1980s. In what was perhaps our most important theme ever, cousins Irita (Goins) Canady and Rhonda (Cook) Tabler -- who appeared on the popular PBS television show Finding Your Roots with Dr. Henry Louis Gates Jr. -- shared some of their experiences. They also helped us learn more about the mixed race branches of our family beginning with the 19th century marriage of Jacob Minerd, a white Pennsylvania German farmer, and native American Ruth Adams. Guests came from Michigan, Indiana, Ohio, West Virginia and Maryland. 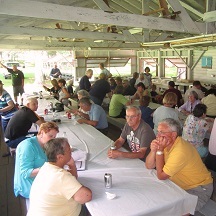 Cousin Dorothy (Bender) Krieg, whose branch of the family left southwestern Pennsylvania in 1852, came from Michigan to attend the reunion with her son and daughter-in-law and visited family graves during a break in the weather. Postscript: We all were shocked to learn that, just six months after the reunion, cousin-speaker Irita passed away in Muskegon, Michigan at the age of 66 on Dec. 18, 2015. Our heartfelt prayers are with her aged mother, children and extended family. There is an extensive interconnection between the Minerd-Miner and Younkin families in southwestern Pennsylvania, with more than 15 known marriages between the clans before World War II. I've been studying these links for years and am fascinated with how close the two families have been. In July, I again was privileged to be part of the Younkin Reunion planning effort and have been involved in some way since 1991. Our committee includes officers Toni Younkin, Linda Marker and Everett Sechler. Among other morning activity, we placed wreaths at the Van Sickle Cemetery near Farmington at the graves of Civil War soldiers (and brothers in law) John K. Rush of the 168th Pennsylvania Infantry and Alexander Sanner of the 62nd Pennsylvania Infantry. Rush was the great-great grandfather of famed actress and singer Shirley Jones, and in planning this beforehand, I had the privilege of speaking at length with Shirley's husband Marty Ingles to let them know about our plans. 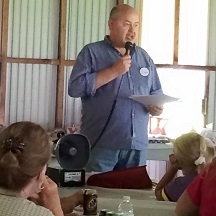 At the event, I presented an afternoon talk on "Seven Things Mama Never Told You" and led the annual auction to raise money for the scholarship fund. Postscript: We all were saddened to learn of the passing of Marty Ingels at the age of 79 on Oct. 21, 2015. See his obituary in Variety. Our hearts to out to Shirley and her family. 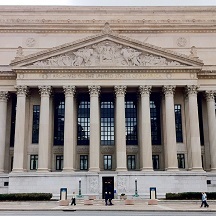 Chatty group at lunch "7 Things Mama Never Told You"
In November, I made another visit to the National Archives in Washington, DC, a journey of discovery that began in 1987. 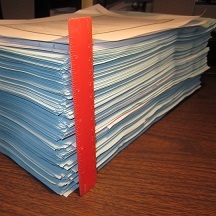 I came away from the latest trip with a five-inch-thick stack of copies of Civil War pension records for 28 soldier cousins of the Minerd, Younkin, Cain and Earlywine families. More than 130 Civil War veterans are known in the Minerd-Miner family and 42 in the extended Younkin/Younken clan. More being discovered all the time. Their pension records go into exquisite detail about the soldiers' lives and sufferings, in their own words, with material available nowhere else. The information has been added to each soldier's biography on Minerd.com. Over the Labor Day Weekend, I spent a very enjoyable day with cousin Rhonda (Cook) Tabler. 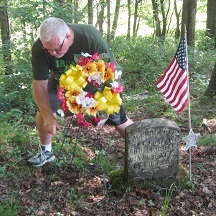 Together, we toured and photographed close to 200 interlinked family grave markers at the Mount Hermon Cemetery in Bern Township, Athens County, Ohio, with Rhonda identifying connections and sharing stories. You may remember that Rhonda -- of the family of John Henry Kennedy -- was one of our very special guest speakers at our waterlogged national reunion in June. 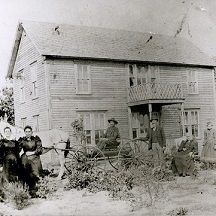 Younkin Migrations to Kansas: 19th and Early 20th Century Pioneer Moves from Pennsylvania to Clay and Geary Counties in the "Sunflower State"
As Minerd.com is now in its 16th year, it's exciting that this work never ends. The site changes almost every week and continues to be fascinating, surprising, eye-opening and never ever dull. New material continues to be shared by long-lost cousins near and farm.